St. Pete Times‘s Andrew Meacham writes: The St. Petersburg Opera Company again closes its season with a musical, this time running two weeks. The extra week for South Pacific anticipates healthy crowds at the Palladium, but also does justice to a serious production. The show allowed me to indulge long-standing curiosities about the acting potential of opera singers and the singing versatility of musical performers. 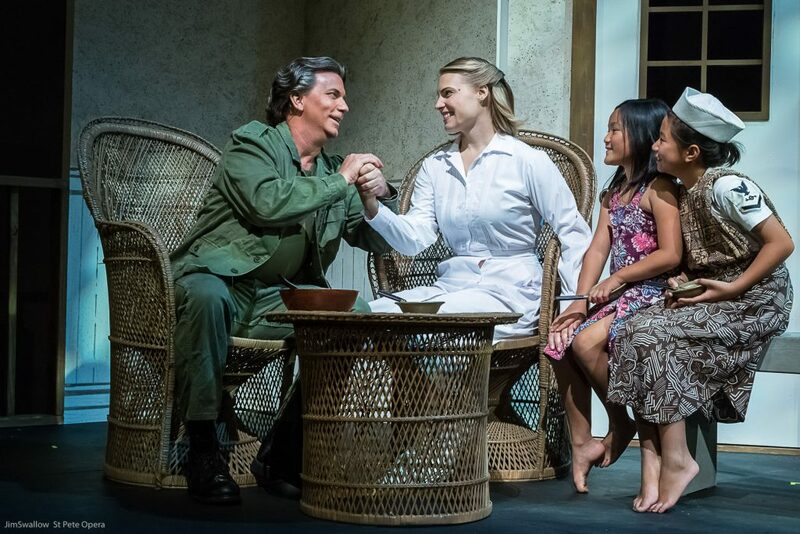 South Pacific shows there are plenty of performers who can do both, including local St. Petersburg talent Todd W. Donovan, who plays Emile de Becque. All of the principals have experience in musical theater and opera. The difference between this show and a South Pacific you might expect to see at a traditional venue for musicals seems pretty clear cut. In this one, as in most operas, the bias favors the music. That is what the audience has a right to expect going in, and it is why this production satisfies. The revival of the 1949 musical in recent years has drawn widespread praise as a reminder of a musical that was bold for its time, with messages about racial prejudice, and panned in a Huffington Post essay as a “colonialist fantasy.” For most, however, the musical has etched a place in Broadway history as an important stepping stone toward racial equality. Significantly, the revulsion felt by Ensign Nellie Forbush toward de Becque’s children with his late wife shows that racism lies in us, not a soft-target “them.” For her part, Molly Mustonen plays Forbush effectively and with all of the requisite wholesomeness. The production directed by Zetta Alderman has made every effort to keep the pace lively, the choreography sharp and the moving parts synchronizing with ease. Conductor Mark Sforzini directs a large orchestra at the top of the stage, establishing during the overture that music will take a top priority. By the time the lights dim, the seduction has set in. Forbush and de Becque hint of their strengths early with the duet, Twin Soliloquies. The South Pacific you knew and loved officially gets into gear in the next number, de Becque’s Some Enchanted Evening. Donovan’s rich bass-baritone voice thrills with a control and a discipline that goes well beyond most Broadway shows passing through the Tampa Bay area. Carla Lopez-Speziale soon follows as Bloody Mary, delivering the strongest character portrayal of the show, from Bali Ha’i onward. 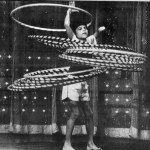 The bow-legged hobbling around the stage seems a bit much at first. But then you forget about all of that and just watch her and listen to her. Lopez-Speziale doesn’t give you a choice. John Kaneklides also earns high marks for his performance as Marine Lt. Joseph Cable, who is torn between his love for Bloody Mary’s daughter and his fear of interracial marriage. His stage presence and haunting tenor delivery are a cornerstone of this production. St. Petersburg Opera did its best to fill the most important spots in a multifaceted musical with professionals, including Ward Smith as the high-strung (and nonsinging) Capt. Brackett. Shout-outs must also go to Jessica Fiala Hall, who played Ensign Connie Walewska and led the dancers, and Tyler Putnam, who adds a comical dimension and a strong voice as Luther Billis. Both men’s and women’s choruses provide a rock solid floor, evident in such songs as There Is Nothin’ Like a Dame, and I’m Gonna Wash That Man Right Outa My Hair. Some talky sequences bog the show down a bit, including some spy-mission, wartime stuff in the second act. Every time the show gets stuck in the sand, Donovan is there to pull it back out. He did so magnificently in his last solo, This Nearly Was Mine, drawing sustained applause.